Kickstarter, in my experience, can be hit or miss. Any given Kickstarter project might have a good sales pitch, nifty graphics, and a well produced video, but creating and shipping a final product is a different matter entirely. A good project will meet your expectations, and a great project will exceed them. And I’m happy to say that since I received the Grafton by Everyman a few months ago, I believe that it fits into this latter category. In fact, it’s quickly become the pen I pick up more than any other. The Grafton is designed as an “everyday carry” pen, something that can easily be slipped into a pocket or purse without having to worry. To that end, the Grafton does a very good job. Its fully aluminum body, which comes with a black or silver finish, can take a beating, and the ‘click’ retracting mechanism is hearty and reliable. The clip, which is kept in place by a couple of tiny hex screws, is strong, yet pliable enough to easily attach to a pocket. Inside the pen, a branded 0.7mm gel ink cartridge is included. The ink is dark and smears a bit, similar to what you might find in a Pilot G-2. 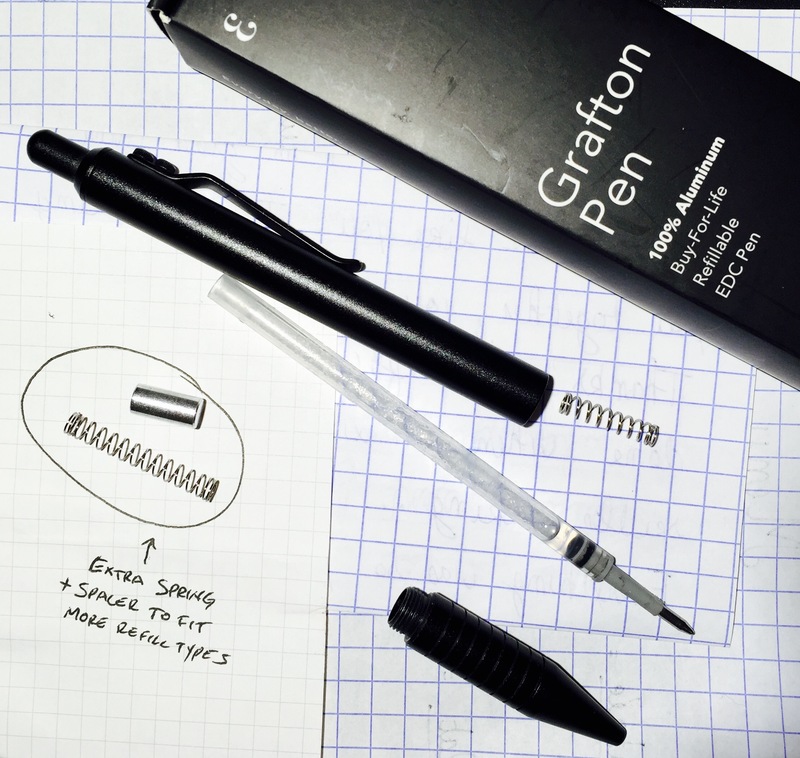 But if you prefer a refill that can write through dirt and water, I was pleased to see that the Grafton also comes with parts that allow a Fisher Space Pen refill to fit inside the barrel. I really like this pen, but that obviously doesn’t mean it’s for everybody (despite the company’s name being “Everyman”). As you can see from my picture, the black finish does get worn with heavy use. I’m actually a fan of this worn look, but it would obviously be bothersome for anyone who likes keeping their pens looking pristine. From a dimensional standpoint, it might also be a bit big for some people. It fits into my pocket nicely, but it’s noticeably longer and thicker than other “everyday carry” pens like the Fisher Cap-O-Matic or the Zebra F-301. My only complaint is that the threading on the barrel sometimes comes a little loose. It’s not so much that the pen falls apart, but it’s enough that I have to re-tighten it at least once a day. It takes a fraction of a second to fix and only occurs when I’ve been using the pen a lot, but I think that it’s a minor annoyance worth noting. Obviously this hasn’t deterred me at all from using the pen. 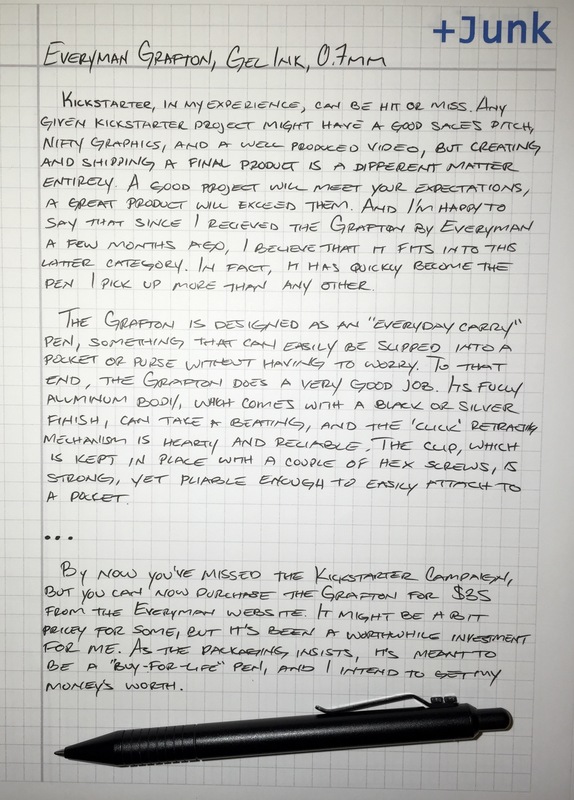 If you’re interested in the Grafton, you’ve unfortunately missed the Kickstarter campaign. However, you can now purchase one from the Everyman website for a little more money – $35. It might be a tad pricey for some, but it’s been a worthwhile investment for me. As the packaging insists, it’s meant to be a “Buy-For-Life” pen, so I intend to get my money’s worth.